Last year Ray Davies released his first new album in a decade. I immediately endeared myself to it. Although I truly liked his two albums released in the 00s, 'Americana' arguably is his best album since the 1970s, very early 80s with The Kinks. At the time of release it was announced that 'Americana' was soon to be followed by an act 2. Just before my holidays started I bought the album, with the intention to listen to it on my iPod. It became a musicless holiday, so time to catch up. Concept albums are no stranger to Ray Davies. Since the late 60s he has released albums, double albums even around a theme. The first being 'Village Green Preservation Society'. 'Arthur Or The Decline Of The British Empire' was presented as a rock opera. In the 70s nothing but thematic albums were released, but The Kinks were out of the public eye more and more as well. In the U.S. the band did acquire an ever growing fanbase. Slowing growing into a rock band in the U.S. tradition with that ironic U.K. observational and humoristic skills always attached to Ray Davies. So here we are in 2018 and Our Country. Americana Act II is released. 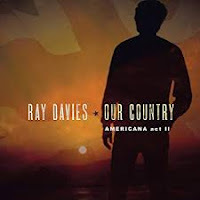 Ray Davies tells his story about himself, his former band and the U.S. From the moment his fascination for this country at the other side of an ocean started, far beyond reach for nearly everybody growing up in the 50s. Unimaginable that you would ever travel there. To dream about the country and cowboys and Indians, John Wayne, guns and righteousness was easy. And then came The Kinks, part of "the invaders" as the U.K. bands breaking big in the U.S. were then called. It allowed Ray Davies to travel to the U.S., see the country for himself and finally, later on in life, to settle there. On Act II Ray Davies again is joined by The Jayhawks. Perhaps it was one huge recording session. Band and lead artist again seem to be having a great time together. They ought to contemplate a lasting relationship as far as I'm concerned. There is a warmth in the recordings and songs. The Jayhawks must be Ray Davies fans to pull this all off. Our Country is a melancholy, nostalgic album. There is a longing for things passed in the whole of the album. Musically the album contains several styles of music that have gone out of style before I was even born, which is a constant in Ray Davies' career. He always manages to make me want to listen anyway. Part is his voice, but another part is the quality of his songs in general. Now he has left The Kinks' U.S. standard behind him, it has allowed him to become less one dimensional. The result is this near unendless stream of songs on Our Country (and 'Americana'), 34 in all. Songs in which Davies explores all the music he has enjoyed in his lifetime, but especially the music, sounds and views that formed him over the years. All the influences that have led him to where is in his early 70s while crafting this set of songs. Part story, mostly songs, with always a story captured in the lyrics. Culminating in a song like 'March Of The Zombies' e.g.. Horns all over the place, a slow shuffle being kept up by the drums. Wild, haunting, contrasting the "free world" with New Orleans. Again a glimpse of Davies' observational skills. But also the terrifying experience he underwent in New Orleans that could have cost him his life, is told, through a song about the bodyguards he used to employ, 'The Big Guy'. Our Country is somewhat more a hodge podge of influences than Act I was, that made it harder for me to find my way into the album. Now that I have, it is easy to conclude that Ray Davies has done it again. This album is deliciously varied with a whole bunch of winners of a song. Where the band and the other musicians on the album let the music shine and thus Ray Davies as a singer. In a way both albums feel like a testament. And in a way they are. Again Ray Davies lets the world know that The Kinks are about to go back on the road, including a new album. We have heard that before. Yes, I'll be there if they do. To sing along to so many of my favourite songs will lead to a fantastic evening. A last chance for sure. Let's see. In the meantime I'm enjoying this new album one more time. Ray Davies rules.